Bo Burnham's big-hearted, emotional tidal wave of a movie shows how the look-at-me / leave-me-alone contradictions of adolescence, powered by social media, are cranked up to 11. No matter that viewers might want her to, there's no moment in Eighth Grade when Kayla (Elsie Fisher) just puts her phone down and endures a blissful moment of non-mediated existence. This is the right thing. To do otherwise would first be disingenuous, given that the writer/director Bo Burnham first came to prominence as a YouTube star. Also, for Kayla, YouTube isn't necessarily a trap. It's the place where she goes to post inspirational videos. She talks straight to the camera with clarity and passion about things like confidence and authenticity. In real life, however, it's a different matter. Unlike most movies about school-age outsiders, Eighth Grade doesn't rely on the traditional dramatic tropes of embarrassment and rebellion. Kayla wants desperately to have friends. Like most shy kids, she's paralyzed in social settings. But unlike most shy kids, she pushes herself past that cocoon of diffident silence. First are her videos, which, you get the impression, are as much for herself as for anybody who might be come across her YouTube channel. This is a girl whose bedroom mirror is ringed with motivational quotes scribbled onto Post-It notes. ("Learn a joke every day!") But also, instead of always hanging back on the periphery, occasionally she jumps. Burnham fills Eighth Grade with stretches of white-knuckle anxiety as he tracks Kayla through her various kamikaze missions. Against her better judgment, Kayla attends a pool party thrown by snobbish popular girl Kennedy (Catherine Oliviere). She braves the gauntlet of dismissal and receives a tiny reward: a few words exchanged with Aiden (Luke Prael), the boy whose very appearance is signaled in a decent audio gag by Burnham with a face-melting techno beat that comes close to approximating the internal noise caused by all her hormones screaming. Later, she walks confidently up to Kennedy, a girl whose social status would normally send an outsider like Kayla running, and starts talking. But even though Kayla doesn't break through in any of these brave attempts to burst out of her social straightjacket, the movie doesn't try to humiliate her for it. Burnham doesn't go by the Todd Solondz rule, where humor is only believed to increase with the greater the character's debasement. Kayla runs up against her share of social barriers. After attempting to talk to a popular girl entranced by her phone, Kayla is finally only rewarded with a drugged-sounding " Whhaattt?" The carelessness of the response is itself a dismissal. Kayla herself is no stranger to the phone. A good part of the movie is given over to her down-the-rabbit-hole excursions into Instagram's cotton candy colors and furious like-spatterings—Burnham scores one such jaunt to Enya, attempting to replicate its otherworldly wash of fantastical gratification and dreaming. The difference between Kayla and her media-glued schoolmates, though, is that she would drop her phone instantly if somebody were to walk up and talk to her. The one who pays attention to Kayla is, of course, the last one she wants to hear from. As her single dad, Mark, Josh Hamilton is a good representation of what Kayla might be like when she grows up. Eager, earnest, and hopeful, Mark has to dance around her moods like the parent of any adolescent, occasionally interrupting her immersion in her phone and suffering the brunt of her teenaged disdain. He takes helicopter parenting to a new level—even watching from a distance after dropping her at the mall, much to her horror. 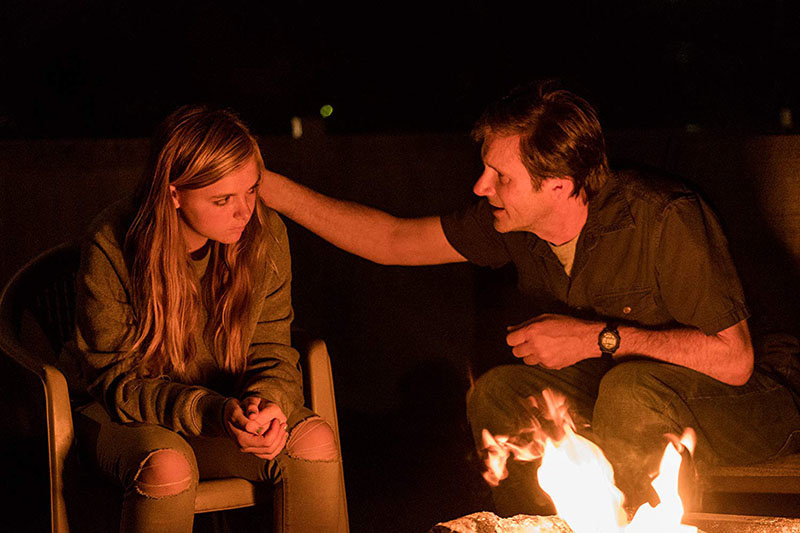 But when he's finally allowed to say what he truly feels about his daughter, the result is a third-act soliloquy whose sweeping emotions are as powerful as that rousing declaration Hamilton gave at the end of Noah Baumbach's 1995 film, Kicking and Screaming. But despite Hamilton's confident work and the estimable comedic chops exhibited by Jake Ryan—playing the earnest nerd who alone seems to connect with where Kayla's coming from—the movie rightly belongs to Fisher. A fine actor, she carries a world of hurt lightly, registering more intelligence and awareness with a glance than many actors can deliver with a page full of dialogue. She handles an uncomfortable backseat scene with an older teenaged boy with a rare vulnerability that's also packed with a coiled strength. This is a star-is-born moment. The same might not be said for Burnham. He works his way through the material with a mostly sure touch, knowing when to swoop in and when to hold back. While the dialogue-heavy set-pieces are almost all successful, the whole thing doesn't always cohere. Too often, he falls back on music to stitch a segment together. A potentially necessary dodge when dealing with such a quiet character, but a dodge nonetheless. Despite these occasional missteps, though, Eighth Grade is a funny, searing, truthful curveball of a story that manages to critique social media without turning itself into a cautionary tale.